HOO stands for Helping Our Own and that’s exactly what this program aims for, to help families within our Crown Heights community. HOO helpers are there to lend a hand whenever someone is in need. HOO sends volunteers to homes in Crown Heights which may be a bit overwhelmed, have many small children, or are going through a difficult time. The program works in conjunction with Yeled V'Yalda, Mother to Mother, Bais Rivkah Headstart, Shifra Puah, and Bikur Cholim of Crown Heights. To contact HOO or to donate please email hoohelpingourown@gmail.com. First begun by shluchim in Michigan, the Friendship Circle is now a nationwide program that has won praise from educators, community leaders, parents, and everyone who has contact with special needs children and their families. Deceptively simple in its structure- the program pairs teenage volunteers with special needs children for learning and social activities as well as weekly visits- the program has proven effective in improving the social, emotional, and mental development and well-being of special needs children for 14 years. It also provides their families with much-needed support. Our 11th graders are proud to be a part of this important program. Volunteering with Friendship Circle not only benefits special needs children and their families. It also nurtures in the volunteers a deep sensitivity and greater emotional maturity. The world we live in is a very dark place. But we can change that because we are lamplighters! We fill the world with light by lighting our own Shabbos candles but even more so by spreading the Mitzvah. Lights is a Mivtzoyim program where high school girls go out to the streets with pamphlets and candles. Armed with the Rebbe's Kochos, they speak to as many Jewish women as they can about the importance of Bentching Licht on time Friday night. Every Sunday, our 9th grade students visit the Jewish community in Brighton Beach. Many of the Jews there are immigrants from the FSU. Denied the opportunity to learn about their heritage while growing up in the USSR, they are excited to see the girls and eager to hear more about Yiddishkeit. 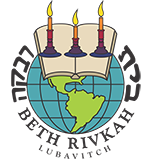 The students hand out brochures in Russian, and before each of the chagim they distribute whatever items are needed to perform the mitzvahs of the chag- matzohs for Pesach, lulavim and esrogim for Succos, and menorahs and candles for Chanukah, to name a few. During their senior year, many girls utilize their more advanced skills to tutor younger girls in any subject area that they are having difficulty with. Students in the senior class act as peer mentors and organize and run the Achos HaTimim program, as well as assuming leadership roles in G.O. and Bnos Chabad. After 3 years of experience as madrichot and participants in these programs, they now have the chance to put their skills and positive memories to use for the benefit of the younger classes- helping them to design and implement creative programming that will give each girl a truly successful, enjoyable, and growth oriented year!